When inspecting kiwifruit you will usually only encounter a few defects. Some of the common defects you may find are: shriveling, bruising, soft and decay. If the kiwi has been in storage you may also come across kiwi which has sunken areas or pitted areas. This is due to moisture loss of the fruit. You can see the sunken area occurring on the circled area above. Is this enough area, to be scored as a defect? 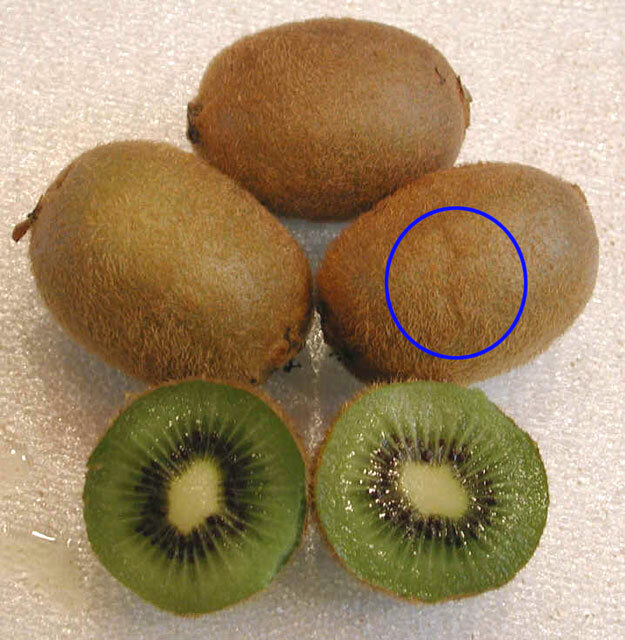 The U.S. Grade Standards for Kiwi don’t offer any specific scoring guidelines for sunken areas, only stating the sunken area may not materially affect the appearance of the fruit. The USDA Inspection Instructions do offer some guidelines. If the sunken area exceeds an area of 1/2 inch on a two inch kiwi, then the kiwi is considered a defect, and would be scored as damage. Looking at the image above, the sunken area appears to exceed the area allowed (1/2 inch) so it would be set aside and scored as a defect. You could have 12% of the kiwifruit with damage by sunken areas, and still make the requirements of the U.S. No. 1 Grade.